46000 W Ann Arbor Trail. Built in 1847 by Moses Allen. Mr. Allen purchased this property in 1829 from John Tibbitts and built a home just West of this house which he sold to his son John Allen (now re-located to 46645 W. Ann Arbor Trail). This home sits on a field stone foundation and has an addition that was also built in the 1800s. In the mid to late 1860s this home was purchased by John S. Kellogg who was the Son of John Kellogg one of Plymouth’s first pioneers. Census records of 1880 show that John S. Kellogg was a widower and lived here with his 3 kids (Henry, Nettie, & Minnie). 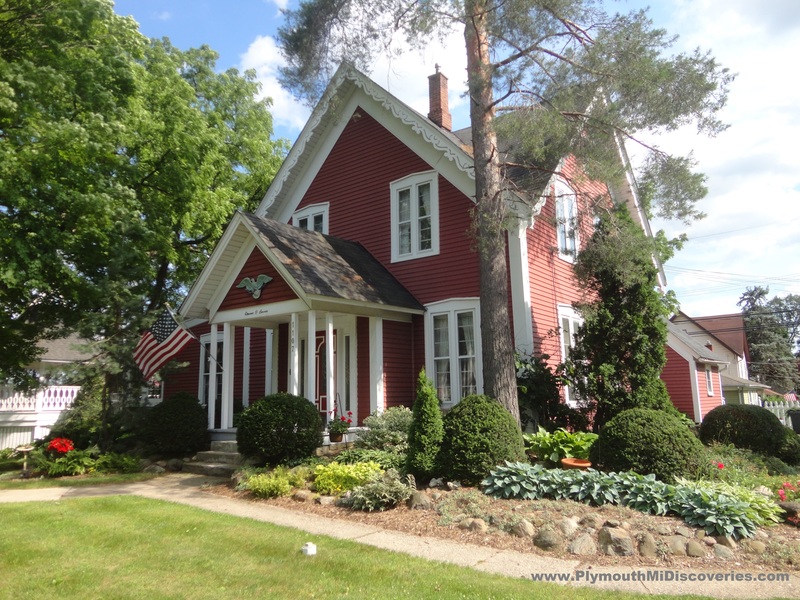 In 1916 this became the home of Frank Rambo who was a Realtor and had an office located on Penniman Ave. Today this home is in great condition and we are proud to have this home stand the test of time and continue to be a great historical part of the Plymouth community. An interesting note is the fact that home records show this house to have been built in 1925… What a big surprise to discover otherwise! 47420 Ann Arbor Trail built in 1928 by Hal Wilson. This storybook looking house that stands at the North West corner of Ann Arbor Trail and Beck Rd is a Cotswold style home with an organic looking cedar shake roof. This home at a quick glance appears to be a humble home but in fact is a 2700 square foot, 5 bedroom residence. After Mr. Wilson lost this home during the Great Depression, the next owner of this home was Norman Ruehr who used to own Heide’s flowers which at one time was the longest running business in Plymouth. Norman’s parents Reinhold & Louise Ruehr purchased Heide’s flowers in Old Village Plymouth from Carl Heide shortly after they immigrated from Germany. This home was given a couple of names by the locals, most popular were the “Casa Llama” and the “Peacock House”. This property used to be inhabited by the Ruehr’s pet llamas and they also had peacocks. The front of the home is also decorated with a large peacock, thus the names it was known as. Inside you could find the presence of an Armor suit and a number of interesting items that were brought from places around the world that they had traveled to. One could overlook these items while standing from the second floor balcony inside. The current owner purchased this home from Emily Ruehr the widow of Norman who passed away in 1997. This is a very unique home that we hope to see will continue to be a part of Plymouth’s landscape for many years. Home of America’s first official Sniper. 45800 W. Ann Arbor Trail was built by John Berdan circa 1833. John was a farmer that owned 160 acres and this home literally sat in the middle of his property right on the Native American trail (now known as Ann Arbor Trail) that ran through the center of his property. Now the most significant thing about this house is that this was the childhood home of John’s son: Hiram Berdan who played a significant role in American History. Hiram was born in New York in 1824 and lived there until his family moved to Plymouth in 1830. Hiram grew up practicing his rifle shooting skills here in Plymouth and eventually became America’s First Sharpshooter. In 1861 (during the Civil war) Hiram was given permission by President Lincoln to form the first regiment of sharpshooters or “sniper” regiment as we would call it today. General Berdan was a World renowned marksman. Hiram was also an inventor who actually developed the first gold amalgamation machine to separate gold from ore, he invented the Berdan rifle and much more. Although published information may vary and no one seems to discuss his time in Plymouth, we have verified through Census records and title research that YES Hiram did grow up here and yes this was his childhood home. Hiram Berdan was brevetted as Brigadier General by President Andrew Johnson. After he passed away he was buried with full honors at the Arlington National Cemetery in Washington D.C.
1107 W. Ann Arbor Trail. Built 1861. Originally the home of Cassius Kellogg, Son of Plymouth Pioneer John Kellogg. Much of the land that now makes up the City of Plymouth was once owned by the Kellogg Family. The “Village Green” which we know as Kellogg Park in Downtown Plymouth was actually donated to the City by the Kellogg Family. The site which this home sits on was also said to have been a ceremonial site for local Native Americans. UPDATE: As of 10/14/2016 We are sad to report that this home was lost to “progress”. Although this home was in great shape and well cared for, it was sold to a contractor and razed in order to built 2 new homes in its place. If you would like to help prevent additional lose of historic homes in Plymouth, we encourage you to follow the Plymouth Preservation Network on facebook and be informed about other homes which may be threatened or things you may be able to do to help.